This library compresses binary data. It provides custom base-256 and base-64 encodings, specially tailored to ESO's character set support. If your addon intends to read the data from a publicly visible source such as a guild note, mail, chat, etc. you will need a way to know that it is your message. If you are using it as internal storage, then you can totally skip this section and move on to Encoding and Decoding and ignore the optional parameters. Important note: always define prefixes as early as possible in your addon. Keep in mind that you want someone that is receiving the data to also already have the prefix defined. If you wait until you're sending data to define a prefix, if person B doesn't perform X (because they are receiving, not sending): they won't be able to receive. prefix: can be anything besides a number. I recommend a small, but unique string. This is a global scope and two addons using the same exact prefix will cause one to fail. Fortunately, if that ever happened the user would get an error message specifying which two addons are conflicting, which would make it easy to report to the author. Prefixes are not limited to the character set of the encoding, only to ESO's overall character set. addonName: does not have to be the official name of the addon, but it is highly recommended for the purpose of the error message in the event of a conflict. purpose: must be unique to the addon, but does not need to be globally unique. Shorter is better. This is used in the encoding and decoding process for an author to distinguish between data when the same addon is using the encode function for different types of data (such as recipes and blueprints). Even if you only plan to do one type of data, a purpose is still needed. base: determines whether this prefix is associated with base 64 or 256. A prefix can only be associated with one base and all future Parse, Encode and Decode uses with this prefix will adhere to what is defined here. Defaults to 256. It does not allow mixed key types in the same dimension but does allow them on different dimensions. It can not reliably support auto-indexed 2 dimensional tables due to Lua being fickle about order. It is only supported for prefixed encoding, meaning if you aren't using DefinePrefix you can't define a schema. As long as you follow the above rules on schema limitations, using schema is very simple: refer to the examples in LBE Test. If your data source is not guaranteed to be purely your data, this will trim it out and give you back a comprehensive table. text_string: any source that returns a string of text that may contain what you're trying to parse. addonName: if included, only strings that use a prefix by this addon will be returned. purpose: if included with addonName, only this specific prefix will be returned. dataToString: determines whether the decode should be handled by DecodeToString (string inside this output table) or DecodeToTable (table inside of a table). This flag has its own function: ParseDataToString. Shares the function ParseFirstDataToString with firstOnly. firstOnly: determines if the parser should stop looking after it has found a match. This flag has its own function: ParseFirst. The returned table will contain the decoded data, the addon name, encoding base, purpose, prefix, schema and schemaType (if applicable). The table is numerically indexed, allowing more than one of the same prefix to exist in the same dataset. binary: can be a number (not recommended), a string or a table of boolean values. It will handle the conversion from the table, so you do not need to worry about whether it is a numeric or boolean binary value. base: 64 or 256. Defaults to 256. If addonName and purpose are provided, this parameter inherits from them and is ignored. The "base256" must be a string or number (not recommended). Returns a table of boolean values. As your schema changes, you will need to handle the different versions that may be in use. This attempts to convert the data from one schema to another. Returns a table or false on failure. If you know the old version won't work, this function will make a blank copy of the new schema instead to be used in its place. These are functions that you don't necessarily need but I found useful. IsTrue will take a value and determine if it is true. Unlike Lua's default, it evaluates 0 and empty strings as false. If strict is true, only the most basic forms of boolean "true" will be considered true. For example: 5 or "content" would evaluate as false. NumBool will take a value (assumed boolean) and return 0 or 1. When combined with doing your boolean checks using IsTrue, it allows saving booleans as a single byte instead of multiple in savedvars, which adds up for addons using a lot of booleans. LBE:SplitString will take an input string and break it down character by character into a table. If "separator" is used it will be the preferred method of breaking the string. This splitter does not consume any characters unless specified by separator. Works like SplitString, except it determines whether the character is true or false and outputs it as a boolean value. Only recommended for parsing binary strings. It is recommended to have users download the library directly. If you want to include it, all you have to do is include the entire folder as is. Regardless of selection, keep in mind the byte size of your prefix (if applicable), the prefix glue is 2 bytes (only applicable if using a prefix) and the check digit is 1 byte. The final size is affected by several factors. 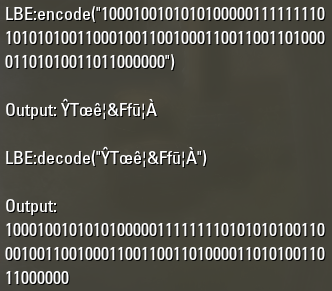 ESO measures input by characters but saved data by byte. 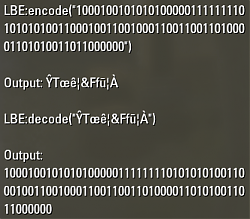 Some of the characters in the encoding are 2 bytes, so the ratio is not always 8:1. The byte size can be checked with # before attempting to send/save it to a location of limited data. This uses purely single byte characters. As such, you can expect a consistent 6:1 ratio. Are you interested but have no idea where to start? Send me a PM and I can easily assess whether LBE will do what you want and how difficult it would be to do. *Replaced non-parsing characters in base-256 encoding. Previously encoded strings may fail to parse. *Changed string 0 to evaluate false. *Added strict flag to IsTrue and NumBool. *Added choice flag for decoding to a string or table. thanks to reduce SavedVariables file ! That looks like a byte per boolean, right? This is designed for purely boolean data and as such compresses it to a bit per boolean. I don't believe MessagePack could fit everything into a guild note (254 character). What is the advantage of this over using a popular implementation such as MessagePack? http://msgpack.org/index.html http://fperrad.github.io/lua-MessagePack/ -- in theory this should be able to just run since it is purely Lua (or Lua-like) implementation without any extra dependencies. The downside is we can't really benefit from choosing our own JIT such as LuaJIT. Cool idea -- good work!